ETA: Galaxy’s Edge has re-released TOTALED on their website. A few years ago, my sister was in a serious car accident with her two boys in the car. It was raining, and she hydroplaned on standing water that had pooled in the low spot of a cloverleaf on-ramp. Her Ford Explorer got tangled up in the gap between a truck and a trailer, then she skidded off the road into a tree. Nobody was injured, but the accident totaled her Explorer. The totaled car got me thinking. What if a person could be totaled? What if medical expenses could be reckoned against earning potential the way repair costs are weighed against the value of car? It’s a dystopian question about trying to determine the value of a human life in dollars and cents. Then my writing mentor, David Farland, nearly lost his son in a longboarding accident. Ben’s recovery has been little short of miraculous, but the medical expenses almost bankrupted Dave. That brought me back to the essential tension between health insurance and the value of a human life. The story doesn’t answer the question; it engages the question. But what about the speculative element? It’s not a sci-fi story without a speculative element! My geeky love of all things SF goes back to the Golden Era when brains in jars tottered around on spidery, metal legs. Huzzah! Spec element acquired! 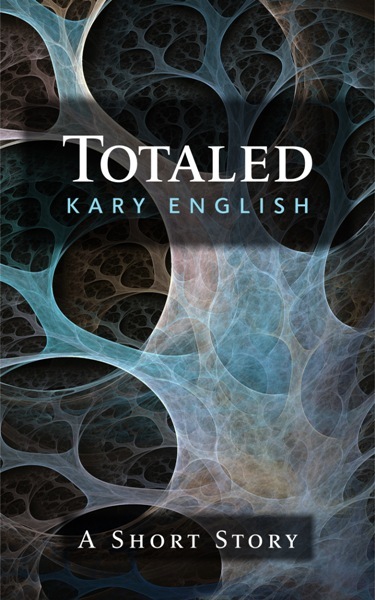 TOTALED would be a brain in a jar story. Sonicated microparticle oxygenation (say it three times fast!) is a real thing that’s already saving lives, though I advanced the technology far beyond what’s possible today. I also know a thing or two about cognitive science and fMRIs, so it wasn’t too difficult to weave those things together. No, the difficult thing was something else entirely. I’d been invited to submit a story to Mike Resnick’s Galaxy’s Edge, and he’d given me a limit of 4,000 words. 4k? Ouch. My natural length for shorts is nearly double that, but I bit the bullet and wrote the story in exactly 4,000 words. Success? Nope. The story was flawed, but I couldn’t put my finger on why. Frustrated, I shipped it off to Writers of the Future for a cooling off period. It earned an Honorable Mention, a low showing for me after a semi and two finalists, so while I’m not knocking HMs, mine confirmed for me that the story was broken. Fortunately, now I knew why. The story had to be longer, and Maggie’s decline needed to be more visible and more poignant. Cackling like a mad scientist, I cracked the story open and added a thousand words to the second half. Writing Maggie’s decline was difficult and intricate, like placing tiles in a mosaic. Each word had to be exactly right or the technique I was using would look like a jumble of typos and bad grammar instead of a deliberate device. I’d say more, but I’m avoiding spoilers. Suffice it to say that Maggie’s decline is the most difficult thing I’ve ever written. Satisfied with my work, I stitched the patient back up and sent it off to Mike, fervently hoping that I hadn’t earned myself an auto-reject by exceeding his wordcount. I got my answer in just a few days. Mike loved TOTALED, and he said such nice things about it at the V30 Writers of the Future reception that I had to excuse myself to go cry in the ladies’ room. So there you have it, the story behind the story. I’m a fan of Mondays. I know it sounds odd, but for me and my writing, Monday is the most important day of the week. Monday has never been about racking up serious word count, or even about diving into monster revisions. Instead, Monday is about prevention. In particular, Monday is about preventing those work-stopping moments that happen all too frequently in a writer’s life. What do I mean by that? Or cat food. Or toilet paper, or any one of a list of things that means I have to stop everything, get in the car and remedy the situation right then and there. Ditto for things like “Mom, I’m out of socks.” Or gym clothes. Or “I need 35 cupcakes and sunscreen for school today and I forgot to tell you.” Doctors’ appointments. Due dates for bills. All of that administrivia of day to day life that tends to throw a wrench in your writing plans if you don’t stay on top of it. So Monday is about staying on top of it. It’s about clearing the deck so I can spend the rest of the week focusing on my work with a minimum of disruption. It’s also about scheduling my writing during the family’s work and school hours so we can be a family on evenings and weekends. I go over the family schedule for details about work meetings, Scout meetings, play practice, permission slips, school minimum days., etc. If anything deviates from the norm, I try to find out on Monday so I can plan my work for the rest of the week. I make a to-do list for the week. (Yes, some of you who know me are shocked by this, I know.) The list covers everything from writing deadlines to bills to doctor appointments. I do about four loads of laundry, fold it and put it away. I inventory the grocery situation, check the ads and pick up anything we’re low on. While I’m out, I fill the gas tank, do any banking and pick up prescriptions, dry cleaning, cat food, etc. I plan dinner for the rest of the week. Most of the time, I’m done and home between 10 and 11 am, and I can spend the rest of the day writing. A well-executed Monday keeps my stress level low and my productivity high by making the week run smoothly. The stress level part of it is important for me because I write my best when I’m relaxed and calm. I hate the weeks where I tell myself that I’ll finish something “next week” only to find that next week has a four hour client meeting, two doctor’s appointments, an after school event and an early dismissal day, a vet visit and a spouse who needs a ride to the airport. My high wordcount days? They’re usually later in the week, made possible by the writerly glory of Mondays. Guess who made the preliminary Bram Stoker Awards ballot? Kamas716 on Guess who made the preliminary Bram Stoker Awards ballot?